Would you believe that it only takes 2 ingredients to make peanut butter magic shell? Incredible, right?! I realize it’s now fall. The end of pool days and drippy ice cream cones. In my world though, ice cream isn’t a seasonal thing. Take these pumpkin snickerdoodle ice cream sandwiches, for instance. Could the convergence of summer cravings and fall-inspired flavors be any easier? Gah!! But really, ice cream in my year-round world doesn’t need to be flavored according to the season. I love cookies and cream just as much mid-winter as I do mid-summer. 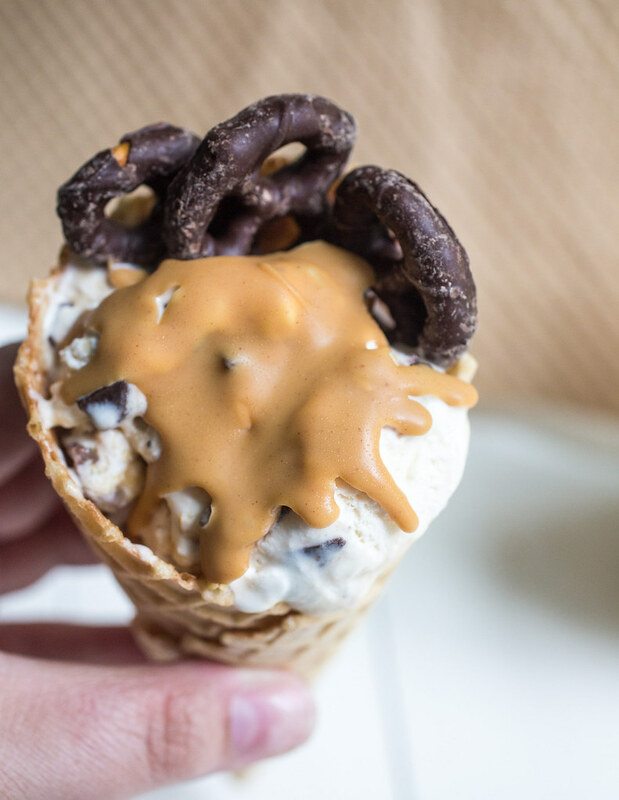 And that’s why this peanut butter magic shell is a complete winner in my book. 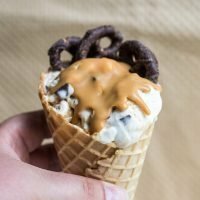 My dad would routinely stir peanut butter into his ice cream at night after dinner, even if the ice cream already had peanut butter in it. That’s my kind of dessert! And my gramma would always always always have chocolate magic shell in her pantry and ice cream in the freezer for the grandkids. So this peanut butter magic shell is kind of a mish-mosh of two really great memories I have. 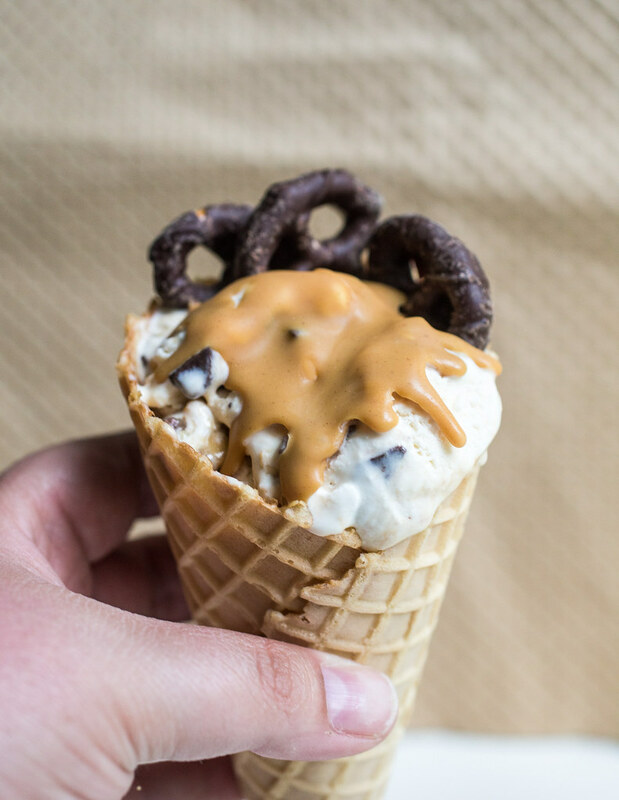 Poured over ice cream, the liquid peanut butter – ahem – magically transforms into a hard shell when it hits the cold ice cream after a few minutes. It’s such a cool thing to watch happen! And it totally brings back all those childhood memories of being at my gramma’s house. 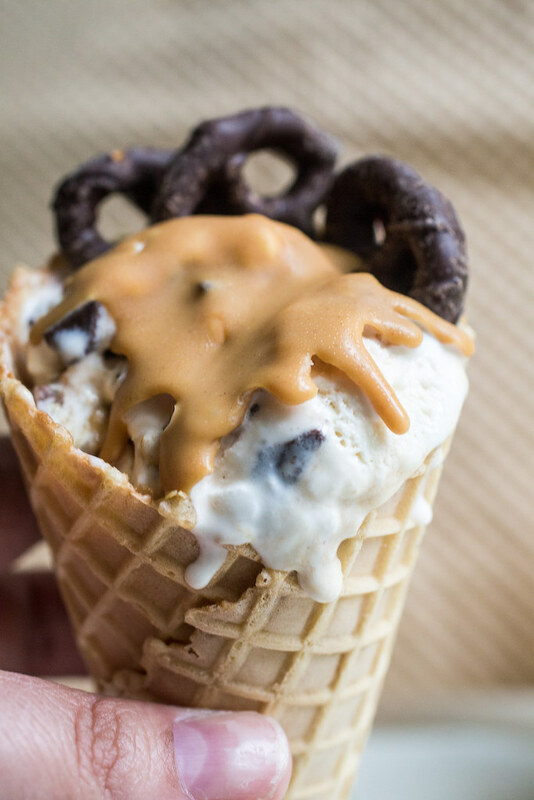 The rich peanut butter magic shell, with all that soft and delicious ice cream underneath, now makes dessert even more difficult to resist! sorrynotsorry. And why, you may ask, is this sauce any better than regular chocolate magic shell? Well, it’s freaking peanut butter, of course! I mean, isn’t peanut butter ANYTHING better than anything else? Unless of course if chocolate happens to be paired with peanut butter like: fudgy chocolate peanut butter cake. and peanut butter cheesecake swirl brownies. and peanut butter cup hot fudge banana bread. And…well, you get the point. Just go make this peanut butter magic shell. Like RIGHT NOW! Peanut butter magic shell will revolutionize the way you eat ice cream. It's a 2-ingredient vegan recipe that takes 1 minute to make! Peanut butter lovers rejoice! Add the peanut butter and coconut oil to a small bowl. Heat in the microwave at 30 second intervals until the peanut butter and coconut oil are warmed through (but not hot) and liquidy - it should take about 1 minute. Stir really well to combine the two completely. Pour over ice cream and let stand for a few minutes while the magic happens (or stick the bowls in the freezer for a faster result!). Storage: Allow any leftovers to return to a semi-solid state, cover, refrigerate (up to 2 weeks), and reheat as needed. You'll want to use peanut butter that doesn't require stirring for this peanut butter magic shell. Something like Skippy or Jiff is just fine here. The extra oil present in natural and organic peanut butter varieties will cause this sauce to separate and it won't harden properly. Also, the "recipe" calls for 1:1 of peanut butter and coconut oil. I made and tested 3 tablespoons and it yielded a heavy ¼ cup of sauce. I'm not sure how it would work if you scaled the recipe up to, say, ½ cup peanut butter:coconut oil but I suggest you start with a smaller amount of oil and gradually stir in more until you reach a thin sauce. What I'm trying to say is that I don't know if there is a "breaking point" where too much oil would just ruin the sauce, so go easy on it. I love how crazy simple homemade magic shell and mmmm this pb version looks awesome! !